Hach's Immunoassay test kits use Hach's rugged and waterproof Pocket Colorimeter II (PCII) instrument to measure parameters such as Alachlor (甲草胺), Total Petroleum Hydrocarbons (TPH 總石油碳氫化合物). Many kits come equipped with soil extraction equipment, also sold separately. 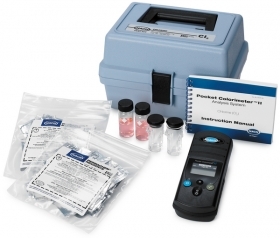 Replacement reagent sets and accessories are also available. Each kits comes complete with instrument, apparatus, reagent, instructions, and rugged Hach carrying case.